After the recent posts about finding information about your visit to Maine, including finding moose, lobster and lighthouses, it seemed natural that we should next post about finding a place to stay. While we would love to have all Maine visitors stay at Brewster House, and as conveniently located as we are for many of Maine’s wonderful places to visit, we realize that occasionally some visitors will want to stay a bit nearer to some of their favorite places, like Acadia National Park, Moosehead Lake, etc. Some of the best sources of information on Maine and Maine bed and breakfasts can be found in the tourist information sites of Maine. The State of Maine Tourism Office site has a large section on lodging, divided by type. They also indicate any specials or packages the B&B may be currently offering. 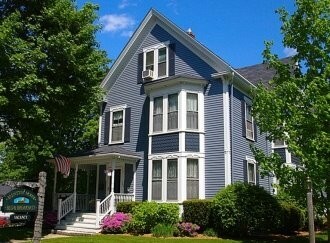 Many Maine Bed and Breakfasts will also be found on the Maine Tourism web site. When you search on that site you’ll want to filter your selection, but be aware that selecting “Online Reservations” may not work the way you expect. Making that selection eliminates any property that does not do its online reservations through Maine Tourism, which is the majority of properties. In other words, many of these properties do have online reservations, but not through the Maine Tourism web site. Finally, Maine Innkeepers Association also lists properties by type. That site is about to undergo a facelift, so it isn’t quite as modern in appearance as others, but the information is still useful. Many areas (whether towns, villages, counties or regions) have web sites with lodging and other information that includes B&B’s. For example, in Freeport you can look at the Freeport Merchant’s Association site, which, while catering to retailers, includes lodging and other area information, including for those bed and breakfasts who are members. Still within the area of Freeport, you will find information specifically about Bed and Breakfast accommodations at the Historic Freeport Bed and Breakfast Association site. That site includes an availability calendar, showing which B&B’s have availability over the upcoming two weeks. More information can be found on the availability calendars for the individual B&B’s. As with finding a Bed and Breakfast almost anywhere, you may also want to try the B&B directories. There are several very large directories, with many B&B’s listed for most areas. You may want to try some smaller directories, especially local directories, as some B&B owners prefer not to list on the bigger directories. One way to find the directories with good lists of bed and breakfasts in the area is to use your favorite search engine and search “bed breakfast” and the name of the town where you are interested (or just Maine, if you are uncertain where you want to visit). For example, you might search “bed breakfast freeport maine”. Instead of looking at the individual results, notice the directories who come up near the top of the listings. These will have a good presence in that area, so following those links and going to the state or city page will help you find a number of selections in that area. Among the larger directories having a good presence in Maine, and where we are listed, are BedAndBreakfast.com, BBOnline.com, BnBFinder.com, and LanierBB.com. There are also directories who are not quite so large, such as Better Bed and Breakfasts, Charming Country Inns, and ILoveInns.com. What areas of Maine are you planning to visit? Leave your answer in the comments!